European Telecommunications Standards Institute (ETSI) on Friday announced a new format standard SIM card for mobile devices. 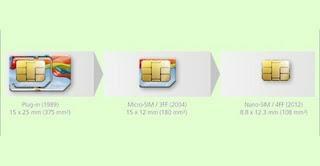 Nano- SIM sized will be 40% smaller than the smallest design to the current SIM card, and will have dimensions of 12.3 x 8.8 x 0.67 millimeters. Several companies including Motorola, Nokia, RIM, and Apple has a contrary opinion regarding the design for the nano-SIM is proposed as a standard, but the design of nano-SIM from Apple finally chosen as the standard according to the report.